This was SJGR's first visit to this private home in Deptford, NJ. We were asked to come by the clients after they experienced seeing shadows and unusual temperature fluctuations. Investigators detected a male moving between rooms, and felt him watching them. A low shadow was also seen in the Living Room. Several names were psychically picked up on, such as Kevin, Michael, and Rachel. While in the Mudroom, one investigator got an impression of orally inhaling hot smoke. The physical evidence collected consisted of 2 EVPs, one of which appears to interact with investigators, and 14 positive photos with anomalies in them. 3.9% of the positive photos obtained falls below the normal range so don't figure prominently into the overall evidence, but two photos correspond to events investigators were experiencing at the time the photos were taken. There was 1 anomalous motion sensor reading, but no EMF or temperature readings obtained during the investigation. 10:10 pm – Investigator Bown took this photo after sensing someone standing in the Bedroom doorway. 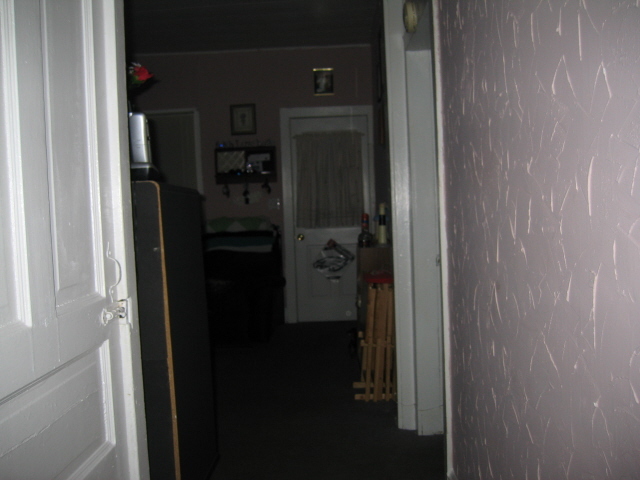 10:26pm - Investigator Apostolico took this photo after Investigator Hewitt asked her to take a photo of the doorway from the living room to the kitchen, and then saw a shadow move quickly from the doorway.